"Castle" star Nathan Fillion told EW he'd love to buy the rights to his former series, "Firefly." Fans have taken it from there. (CNN) -- True Browncoats, like the fictional freedom fighters they named themselves after, don't give up easily. Those diehard fans of "Firefly," the 2002 cult TV hit, have a history of turning to the internet to buck improbable odds in defense of their favorite show. Now, they're at it again. Just days after an apparently offhand comment from Nathan Fillion, who played Capt. Malcolm Reynolds on the short-lived Fox series, the Web has once again lit up with efforts to revive the sci-fi franchise. 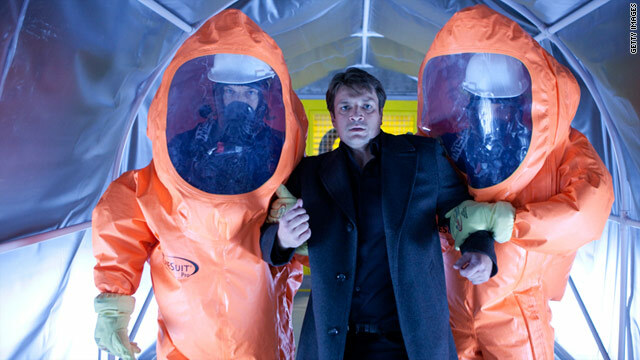 Last week, Fillion, who now stars in ABC's "Castle," told Entertainment Weekly he'd love to play Mal again. Then, he ratcheted things up a notch. "If I got $300 million from the California Lottery, the first thing I would do is buy the rights to "Firefly," make it on my own, and distribute it on the internet," Fillion told EW, a CNN.com partner. Then, some possibly surprising online reactions started rolling in. The next day, former "Firefly" writer Jose Molina wrote on Twitter: "For what it's worth, I've told him I'd drop what I was doing and follow." Then, Jane Espenson, who wrote an episode, chimed in: "I'm there, if needed," she tweeted. Jewel Staite, who played ace mechanic Kaylee on the show, had a simple answer when a Twitter follower asked if she'd be on board: "Is the Pope Catholic?" That was more than enough for fans (whose "Browncoat" nickname, by the way, comes from the Western-style dusters worn by Fillion and others on the show). A website, "Help Nathan Buy Firefly," popped up, under the title "Let's get the Captain his money." The goal? To set up a means of collecting pledges that would turn into donations if a revived "Firefly" looks like it could become a reality. The pledge system hadn't been officially created as of Tuesday, but fans were already writing in the site's comment section that they're willing to pony up. In five days, the site's Facebook group had picked up more than 33,000 members -- about 10,000 of them in the past 24 hours. The two creators of the site are remaining publicly anonymous for now. In an email to CNN (which came from an address linked to the site and was mentioned on the group's Facebook page), they said they work in the nonprofit field but "have no credentials to speak of" in the TV/film industry or "Firefly" community. They acknowledged that the odds that Fillion was serious about buying the show's rights are "pretty low," but hope the community's willingness to support some sort of revamped "Firefly" will encourage creator Joss Whedon or someone else with the proper clout to make a move. "Joss paid out of pocket to make [Web series] 'Dr. Horrible,' and it's not only paid him back, it's paid the folks involved," they said in the email. "We'd like to see him be willing to let fans become his pocket and revisit ['Firefly']." They say they "won't take a penny" from anyone until someone like Whedon or Fillion gets involved in an effort to revive the show and would look to set up a not-for-profit foundation or something of the sort if that happens. Other devotees of the cult favorite say they're not surprised by the quick Web action. "I couldn't believe it when I first read the story," said Brian Harvard, co-creator of the 25,000-member-strong "Bring Back Firefly" Facebook page. "Then, all of a sudden, everyone's posting these links to the 'Help Nathan Buy Firefly' page and I said, 'We've got to help get the word out about this.' "
Even before "Firefly" was officially sacked in 2002, fans had taken to the Web to try to save it. Using the online tools of the early 2000s -- message boards, fan sites, chat rooms and LiveJournal blogs -- they organized. Call it an early example of crowd-sourcing. They collected money for an ad in Variety, organized a postcard-writing campaign to Universal Pictures and, when the DVD box set was released, raised $14,000 to put copies on 250 Navy ships for the crews to watch. The fan base's self-styled guerrilla marketing is widely considered to have helped Whedon get funding for 2005's "Serenity," a feature film that draws together some of the loose ends from the series. "On the internet, that was one of the first times you've seen such a drive to bring something back," Harvard said. "Now, with the advent of Facebook? My goodness -- that's probably the most useful tool, next to the internet itself, to really bring some fire under this movement." But he says that doesn't mean nothing will come out of the internet reaction to it. "Even if this project goes nowhere, at least it's something to show the powers-that-be that there's a product there that could be making them some money," he said. Fillion was talking about the series after the Science Channel announced they'd be airing reruns of the original series. The episodes, which begin airing at 8 p.m. March 6, will include segments with the network's Dr. Michio Kaku commentating on the science portrayed in the show.